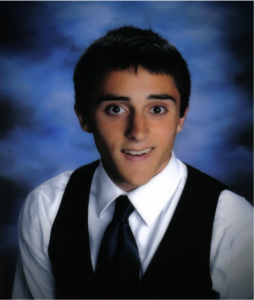 I am a sophomore majoring in philosophy and Italian language and literature. I will be studying abroad at the University of Bologna next year, taking classes in both Italian literature and philosophy. In my spare time I like to play piano and pretend that I am a capable singer. My SLA Grant is important to me because it is the beginning of my experience in Italy as a speaker of the language. After studying abroad this summer and over the course of the next academic year, I am considering applying for graduate school in Italian studies or teaching English in a school in Italy through a Fulbright program. As my proficiency with the Italian language increases, I hope to be able to engage the Italian literature that I love so much, particularly Dante’s Divine Comedy and other works of medieval Italian literature. The chief goal of my trip is to increase my fluency in the language while studying abroad. 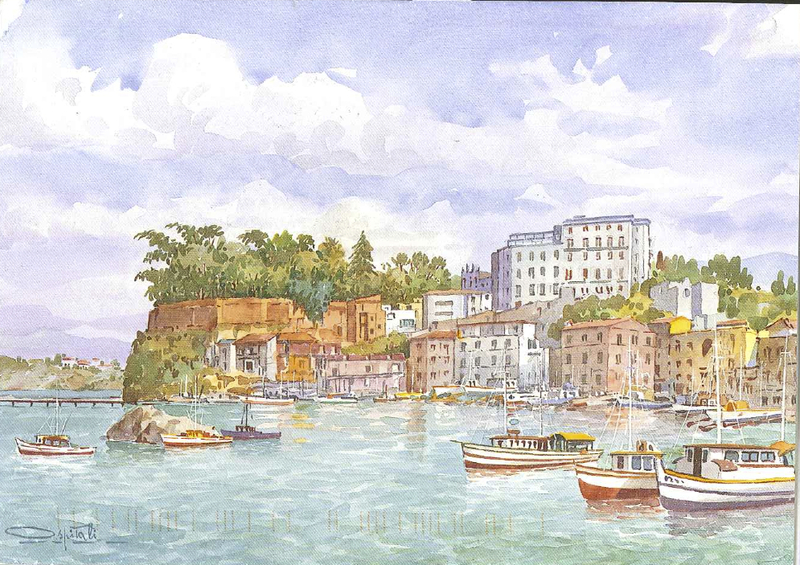 I also hope to acclimatize myself to the culture of the people while staying in Sorrento. I envision my summer abroad time as a sort of prelude to my year of study at the University of Bologna in the 2012-2013 academic year; I hope to gain a level of comfort and familiarity with the language, especially with regard to idiomatic expressions and slang, as to ease the transition into life in Bologna next fall. At the end of the summer, I will be capable of holding a casual conversation with a native Italian speaker. At the end of the summer, I will be be able to write detailed analytic papers on Italian texts in the language. At the end of the summer, I will be able to give class presentations in clear, accurate Italian. I hope to immerse myself in the language and culture of Italy through interaction with the host family that I will be staying with while studying in Sorrento. Simple daily interactions will grant me the opportunity to advance my proficiency in the language. I also plan to travel around the city in my free time and take part in various cultural activities as to come to know what it is like to be an Italian citizen. By making an effort to avoid speaking any English whenever I can, I hope to pick up on Italian slang and gain an understanding of the language that isn’t strictly limited to the textbook. The morning of my flight met me with a strange mix of excitement and trepidation. Not one at some points and one at others, but an even mix. This would be my first time outside of the country, my first time flying alone, the first time I would be able to test any semblance of “independence” that I considered myself capable of exercising. The two weeks before my departure had not been all anticipation—a week before I had come home for the semester my grandfather had passed away. Born and raised in a small farming village in Sicily, my grandfather had made his name as a local farmer before moving my mother and her family to the U.S. when she was only eight. To the day he died he hardly spoke a word of English, and the Italian he spoke was mainly the Sicilian dialect which would have seemed like Cantonese even to my newly-trained standardized Italian ears. I had chosen to study Italian to explore my roots and to finally be able to speak with my grandfather—and had returned home a week too late. Somehow, it seemed like my grandfather’s passing could have occurred at no other time. 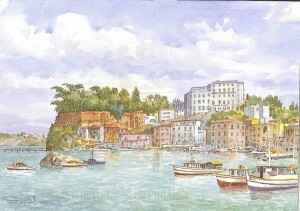 In the wake of my grandfather’s passing, many of my mother’s relatives from Italy had called to offer their condolences—and expressed excitement when they had learned that I would soon be travelling to Sorrento and later studying in Bologna, insisting that I meet them while in Italy and offering their houses for me to stay. In this way, a moment of sadness was transformed into one of opportunity and strength. I begin my trip, then, eager to see a new world and to enter into this new life. The streets of Sorrento are filled with people ever moving. 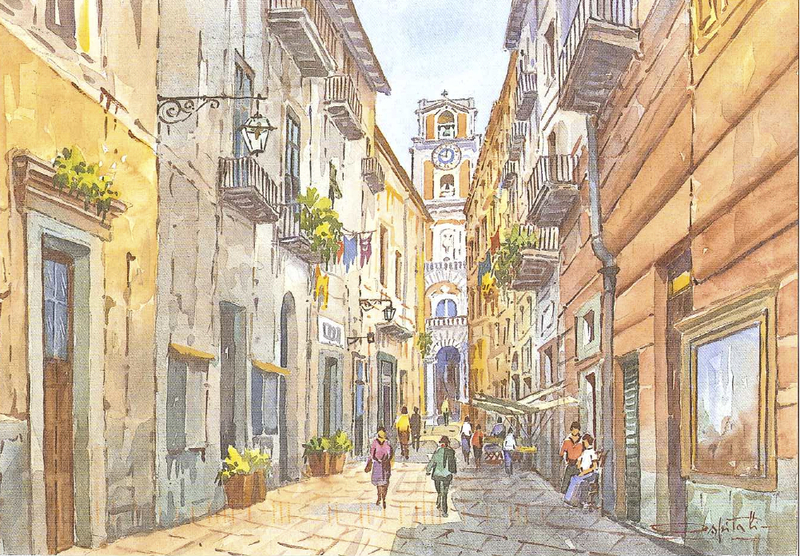 Tourists, locals, children, grandparents, young couples—bustling about the piazza at their daily business. Vespa scooters and other motorinos weave in and out of the traffic of FIAT’s, busses and smartcars, displaying no care for the safety of their lives. Waiters, chefs, shop-owners, artisans, musicians, teachers—the people here seem to unanimously express their contentment with their lives. Perhaps it is because they know nothing else, or perhaps it is only a façade—but something tells me that there has to be some truth in it. Family, a beautiful day, a walk through town, a good meal, a glass of wine, chatting with friends, a polite “ciao” on the street—“dolce fa niente,” the sweetness of doing nothing—these are enough. What else could make a person happy? Soccer is taken extremely seriously here. I cannot underline this point enough. The director of our school program here quipped that soccer matches are the only times that all of Italy comes together—such is the ardor for the sport and the patriotism for the country. Presently, the EURO 2012 tournament is in session, putting the entire country in an uproar and on the edge of their seats as Italy plays to qualify. The ardor that Americans share for their favorite football or baseball team doesn’t begin to touch the passion of the Italians for their team, their country and their sport. One gets the feeling that every TV in the country is tuned into the game when Italy is playing, causing Italians to flock to local bars and restaurants to watch the game with their friends. I daresay that this isn’t necessary—one tends to know exactly the score, the number of missed shots, the star players, and the unfairly awarded penalties just by the shouts and airhorns that go off at every significant play. The night that Italy qualified for a quarterfinal match, one would have thought that a riot was stirring throughout the town—so loud were the fireworks, noisemakers, airhorns, carhorns and shouts of victory, which continued well after the match was won. It’s a level of excitement and competitive spirit that would put the most diehard baseball fan to shame. It can be difficult following the quick chatter of the commentators, but makes for excellent practice in language comprehension. On June 2nd, Italians celebrate the Festa della Repubblica, a national holiday commemorating the nationwide vote in 1946 for a republic form of government over a monarchy after the Second World War. The moment was a significant one in Italian history as it established the current order of the nation and marked the end of Fascist rule. My host mother likened the holiday to the 4th of July for the United States, explaining that the day is essentially a 24 hour siesta. This was obvious from walking around the square that day—the streets were filled with people ambling about and lounging at their favorite cafes enjoying the nice weather and festival atmosphere. Small jazz quartets played throughout the streets that day which concluded with fireworks shows that night. Che pariata—similar to “che stupendo” or “che bello” in standardized Italian; essentially a slang expression of appreciation or marvel. Pina insists that the phrase is “giovanile”—an expression used only by younger age groups. Fabrizia confirms this, saying that the phrase is a little more “hip” and only used among people like her friends and Italians around my age. Managgia—similar to “un peccato,” which literally translates to “a sin” but in context is closer to “what a shame!” An older word typically used only by adults, such as the middle-aged man sitting next to me on the hydrofoil from Capri one day and shouting in anger at a missed shot on goal by one of Italy’s attackers. The seafood here is especially fresh, and the gnocchi alle vongole (dumplings with clams) are a local favorite and quite fantastic. The gnocchi pasta is made here in Sorrento, and of course the clams are caught locally; a good preparation will have all the clam shells opened (shells that remain closed should not be pried open to be eaten). Another of the dishes typical of the region is the insalata caprese, a plate of sliced tomatoes, basil leaves, and fresh mozzarella drizzled in olive oil, balsamic vinegar and herbs. The Italian attitude towards the U.S. seems to be generally positive. A local shop owner, a waitress at a restaurant and my host mother especially expressed approval at Barack Obama’s presidency, adding in a quip that they wish Berlusconi could have been more like our own commander in chief. Local Italians my age all expressed ardor for the music scene of the U.S., saying that most of the songs that are played in the disco-techs are American—a fact that I can confirm from experience. My host sister, aside from being enamored with the recently popular boy-band One Direction, tells me that she loves American movies and Hollywood in general (all dubbed in Italian, of course) and expressed jealousy when she learned that many of the movies that she had only seen just recently had been released in the U.S. for months and even years prior to their Italian debut. The disco-techs are extremely popular here in Sorrento at night. Maybe this is a genuine difference from the U.S., or maybe it simply reflects that I’m not one to frequent nightclubs back home. In any case, many young Italians flock to the clubs and bars on the weekends and even some days during the week. The beaches are the activity-of-choice during the day. The water, aside from being especially salty, is the clearest you will find anywhere. One other major difference stands out between the beaches of southern Italy and those of Lake Michigan: there are virtually no sand beaches, and where there are, the sand is the black color of volcanic ash. Instead, the coasts are lined with large, dark slabs of rock. Locals and tourists alike do their best to seek out the flattest real-estate and lay down a towel to tan in the hot Mediterranean sun. Over the course of these five weeks, I’ve had the opportunity to visit three locales outside of Sorrento: the coastal town of Positano, the island of Capri, and the ancient city of Pompeii. Positano, which is a popular locale for tourists, turned out to be one of the less-impressive visits overall. While the cliffsides and outlooks onto the Mediterranean were certainly breathtaking, we found the beaches there to be somewhat crowded and not the cleanliest. The nearby beaches that my host mother directed us to (populated mainly by locals) proved to be much more beautiful and better for swimming. Goes to show what tourists know! Pompeii, the Roman-Greek city covered by the volcanic ash of the eruption of Mount Vesuvius around 70 B.C., was an interesting sight to behold. The city is incredibly well preserved for having been destroyed by a volcano—among the more interesting sights were the coliseum, the bath houses, and the outdoor eating areas, which our tour guide likened to “fast-food stops.” Most incredible and terrifying of all, however, were the mummified corpses of Pompeii villagers killed when the volcano erupted. Horrifying, but strangely captivating as well. The month that I stayed in Sorrento has accomplished exactly what I hoped it would—I now feel confident and prepared to begin classes at the University of Bologna and to function as an Italian student this coming academic year. The evenings I spent chatting with my host mother and sister have provided me with a comfort and familiarity when speaking the language. The medieval Italian literature class that I took, which seemed would be the most challenging aspect of the trip (taught exclusively in Italian) has eased my fears about the difficulty of taking classes in Bologna. I feel an overwhelming sense of gratitude towards the teachers at Notre Dame who prepared me for this trip. I’ve found myself immensely capable of navigating the streets of Sorrento with the year of Italian that I have learned, convincing waiters, my professor, shop owners, my host family, common street-goers and young Italians alike that I am just another Italian kid. Perhaps the pinnacle moment of my language abilities came when I managed to join a local gym and understand the advice that a trainer gave me by remembering the vocabulary word for the knees. For this I owe a thousand thanks to my TA, Alberto Lo Pinto, and my professors Alessia Blad and Patrick Vivirito for preparing me so well to speak the language and just for being fantastic people in general. Many thanks as well go out to Christian Moevs, who aside from preparing me especially for the Medieval Italian Literature class that I took at the Sorrento-Lingue school has proven to be a fantastic mentor and friend. Grazie mille amici! As my Italian improved I realized that the process was most facilitated by a laidback, organic approach. I experienced the greatest improvement when I was not obsessing over interpreting the exact meaning of a phrase that was spoken to me. With time and confidence, I found that I could comfortably understand the people with whom I spoke—and could speak back to them effectively and fluently.Coming to understand the cultural differences that I experienced in Italy was a matter of withholding my own prejudices. Before long I realized that the perceived differences I faced were largely of my own creation. To generalize a culture is to negate the individuality of the people that are said to live within it; I came to realize that people are people wherever they should be. The greatest take away from my summer language abroad experience was the confidence that I developed—being in a foreign environment, not only geographically but also linguistically and culturally, allows you to see the “stuff your made of,” in a manner of speaking. Time spent travelling abroad is invaluable and should be approached with both an open mind and an open heart—be willing to make mistakes, to laugh when you make them, and to pick yourself up all the same and move forward. My experience was by no means flaw-free, but learning to face these hiccups and embrace them is empowering. As I sit here typing this in my apartment in Bologna, I am filled with a calm confidence as I look back on my time in Sorrento. My month spent abroad over the summer has allowed me an extremely smooth transition into life in this city, making my search for an apartment a stress-free endeavor and my interactions with my fellow Italian flat mates natural and fun. I am eager to begin classes at the University of Bologna and feel very prepared to do so. 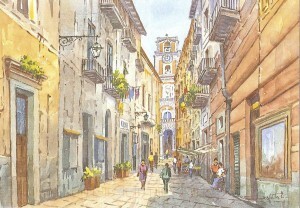 My time in Sorrento has prepared me to have what I anticipate will be a life-changing experience in Bologna this year.